Interventionist research has been proposed as one way of increasing societal impact of management accounting (MA) research. However, there are no guidelines regarding what sort of phenomena would be the most suitable ones to be studied using research interventions. This book builds on top of the methodological literature of interventionist management accounting research, as well as the published studies applying it. Through selected case studies, Interventionist Management Accounting Research shows how societal impact of MA research can be increased by not only applying IVR approach, but also looking into how MA is used in the borderlines between MA and other organizational functions. In many cases, MA research can provide tools and concepts helping to understand contemporary trends within the business environment, thereby naturally providing potential for increasing the societal impact of scholarly work. In particular, this book discusses how to position empirical research endeavours with interventionist elements in a way to ensure important theory contributions with outcomes interesting also outside the MA academia, whether that means MA practitioners, managers in general or scholars in other fields of management. 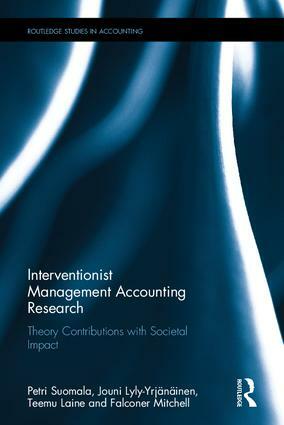 Aimed at primarily researchers, academics and students in the fields of research methodology, management accounting and interventionist research, this book provides methodological guidance on how to execute research projects with interventionist elements, aiming at strong theory contribution with broader societal impacts. Focusing on research in accounting and management, this book also provides interesting insights to scholars and doctoral students in other fields of management research. Petri Suomala is Vice President of Teaching and Learning Services at Tampere University of Technology, Finland. Jouni Lyly-Yrjänäinen is a University Lecturer in Industrial Management at Tampere University of Technology, Finland. Teemu Laine is Assistant Professor at Tampere University of Technology, Finland. Falconer Mitchell is Professor Emeritus of Management Accounting at the University of Edinburgh, UK.